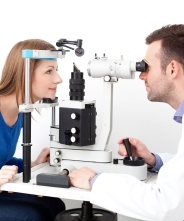 During your office visit, your eye doctor may order some diagnostic tests to help evaluate your ocular condition. If you are scheduled for diagnostic testing, you should plan for an office visit duration of approximately 1 to 3 hours. Below are some common ocular diagnostic tests. - If you have a symptomatic Cataract, your doctor will obtain measurements of the eye (or biometry) to determine which artificial lens is best for implantation after cataract removal. Biometry measurement of the eye for cataract surgery uses ultrasound or light to obtain accurate measurements. This is a painless non-contact test performed at your eye doctor’s office. If you wear a soft contact lens, you should stay out of your contact lens for 2 weeks prior to your visit for biometry for cataract surgery. If you wear a hard contact lens or rigid gas permeable lens, you should stay out of your contact lens for 4 weeks prior to your visit for biometry for cataract surgery. - If you have Glaucoma or are a glaucoma suspect, your eye doctor may obtain a visual field test to determine the existence and/or the severity of your glaucoma by testing your peripheral vision, or side vision. In the visual field test, you will be asked to press a button if you see a light in your side vision while you are looking intently at a central target. It is important to not look away from the central target during the test. Your eye doctor may repeat the visual field test on a regular basis to keep track of your glaucoma. Optical Coherence Tomography (OCT) - Your eye doctor may obtain an optical coherence tomography (OCT) to evaluate your Glaucoma, Macular Degeneration, Diabetic Retinopathy, or other conditions, such as optic neuropathy. OCT is a painless non-contact eye scan utilizing light to measure the thickness of the optic nerve head and retina for damages. Your eye doctor may repeat the OCT on a regular basis to keep track of your eye conditions. - Your eye doctor may obtain an intravenous fluorescein angiography (IVFA) to determine the existence and/or severity of your Macular Degeneration, Diabetic Retinopathy, or other retinal or optic nerve condition. During an IVFA, pictures of the eye are taken before and after a dye is injected into the vein in the arm. This is to test the blood flow in the blood vessels in the retina and choroid, so as to determine if the blood flow is normal or defective, or if there is any leakage of the blood vessels in the area of concern. Tell the doctor if you may be pregnant, although there has been no study to show it is harmful during pregnancy. When the dye is injected, you may have mild nausea (in about 10% of the time) and a warm sensation. These symptoms are usually very brief and resolve spontaneously. The dye will cause your urine to be orange in color for a day or two after the test.